When Erik, a Danish architecture professor, inherits a mansion, his wife, Anna, a television newscaster, convinces him to turn the place into a commune. This will have the double advantage of making sure the house’s steep overhead can get paid for and that the middle aged couple can open up to a broader life perspective. Win/win, right? The time is the 1970s in liberal Copenhagen and the attitude is live and let live. Their well-adjusted 14-year-old daughter, Freya, welcomes the shift from nuclear family to collectivism, but Anna seems not to have considered how the situation can’t help but alter their entire life overview. Erik is a classic case of a liberal alpha male whose axiomatic need to control his surroundings is undercut by both the demands of his fellow collectivists and his need for privacy. The Commune poses tough realities about individuality vs. collectivism — a conflict that underscores so much of our lives as citizens in a society and economic system, whether we live communally or not. At what point do we abandon our own personal sovereignty and hand it over to those who don’t necessarily value it as the sacred thing it is? At what point do we become tribal? 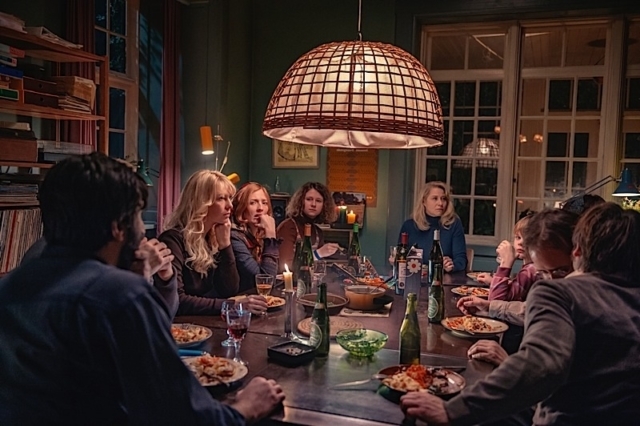 Writer-director Thomas Vinterberg and co-writer Tobias Lindholm raise fundamental questions about alternative lifestyles and their feasibility. It’s a forthright look that makes no excuses for inherent pitfalls, yet it also recognizes the emotional beauty that can nonetheless shine through such lifestyles. Both Anna and Erik are blindsided by the effects of their choice and ultimately pay a price. Audiences will see this film from different angles. The Commune is not a film that will align the general audience on one side or the other. Trine Dyrholm as Anna and Ulrich Thomsen as Erik give marvelous performances as likable figures whose weaknesses seem to overthrow their capacity to reason. Dyrholm portrays Anna’s breakdown with profound empathy, relating to us, that one must be cautious when boldly challenging traditional relationship norms. Thomsen brings deep humanity and vulnerability to a role that lesser actors would have turned into a patriarchal stereotype. Martha Sofie Wallstrom Hansen adds rich dimension as Freya, an adolescent who comes into sexual consciousness as the film’s communal ramifications unfold. Whether we judge that the couple made a right or wrong choice in bringing forth the commune, we must consider that they most certainly learn about themselves in a way that perhaps no other experience could have taught or shown them.